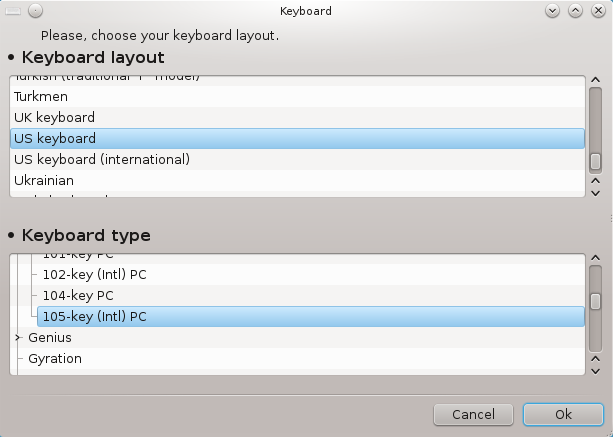 The keyboarddrake tool helps you configure the basic layout for the keyboard that you wish to use on Mageia. It affects the keyboard layout for all users on the system. It can be found in the Hardware section of the Mageia Control Center (MCC) labelled "Configure mouse and keyboard". Here you can select which keyboard layout you wish to use. The names (listed in alphabetical order) describe the language, country, and/or ethnicity each layout should be used for. This menu lets you select the type of keyboard you are using. If you are unsure of which to choose, it is best to leave it as the default type. You can start this tool from the command line, by typing keyboarddrake as root.